EJOT offers various SUPER-SAPHIR self-drilling screws to form floating and fixed points in rear-ventilated facades. They perfectly fasten pre-drilled stainless steel or aluminium wall brackets to aluminium support profiles. These facade screws are made of A4 stainless steel and feature a hardened steel drill point. A buffer zone between the screw head and the sliding disc prevents excessive clamp load of the joint. Especially for fastening pre-drilled wall brackets to support profiles, EJOT has developed a universal fixed and floating point screw made of A4 stainless steel. The usability of all possible component combinations and their characteristic load-carrying capacity values are regulated in a general building inspection certificate (P-BWU02-178006). The universal solution to form floating and fixed points of rear-ventilated facades. The applications range from wall brackets made of stainless steel with a thickness of ≥ 1.5 mm up to wall brackets made of aluminium with a thickness of 2.0 to 5.0 mm. The support profile may vary from 2.0 to 3.0 mm. 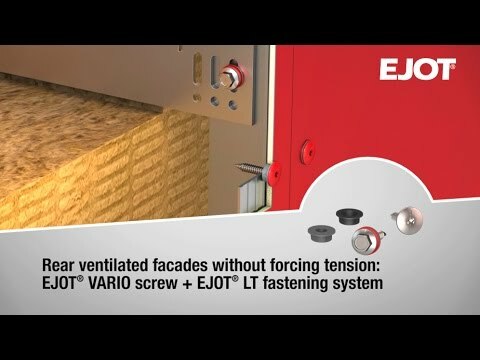 For the forming of floating and fixed points, EJOT offers various centring bushes: the centring bush F (fixed point) and the centring bush S (floating point) In combination with the EJOT LT screws with a head diameter of 16 mm, the are perfectly suitable for the fastening of facade panels. For the structural fastening of ALUCOBOND panels to aluminium substructures and for the fastening of ALUCOBOND exterior wall claddings according to Z-33.2-6, the two EJOT stainless steel SAPHIR self-drilling screws JT4-XT and JT4-FR-2H/6-4.8 are part of EJOT's product range. For the fastening of timber laths and plaster-base sheetings to aluminium substructures, EJOT offers the JT4-S-2-4.8 and the JT4-STS-3-4.8. So no matter which solution you are looking for to form floating and fixed points in the rear-ventilated facade, EJOT offers the right facade screws for a variety of applications in rear-ventilated facades.